Basketball diplomacy is a topic I'm working on across multiple strands. Recall my earlier piece on the phantom documents pertaining to French-Chinese hoops diplomacy? Right. While that's the only example I've come across thus far of mysteriously no documents, hoops diplomacy occurs daily across time: past, present, future. Take the example of Boston Celtics legend Bill Russell, who conducts unofficial forms of basketball diplomacy each time he posts on Twitter. Check out my recent VICE Sports piece on "On Twitter, Russell has Jokes, Takes, and a Lasting Legacy of Activism." For me, the most interesting angles come towards the end of the article, about how Russell is reaching younger, newer fans overseas as the C's fanbase expands with its international players. While we’re in the crux of the NBA Playoffs, a friendly reminder that there’s still one Frenchie left in the competition, the Celtics’ Gerschon Yabusele. Sport and diplomacy have been at the forefront of my mind in other ways. A few weeks ago, I had the good fortune to visit Washington D.C., my old stomping grounds, to talk about politics, protest, and sports with colleagues at the U.S. National Archives. They’re pulling together a fantastic exhibit on the topic for 2020, and I’m thrilled that two themes I’m passionate about – sport and diplomacy, and sport and identity (gender, race & more) – are key pillars of the project. The Smith Center, home of George Washington University basketball, was transformed for the occasion. The meeting coincided with French President Emmanuel Macron’s official State Visit. There’s a rich tradition of Visits by Foreign Heads of State – the first was in 1874 by King Kalakaua of Hawaii (where one side of my mother’s family is from). State Visits are a bit different. And fun. 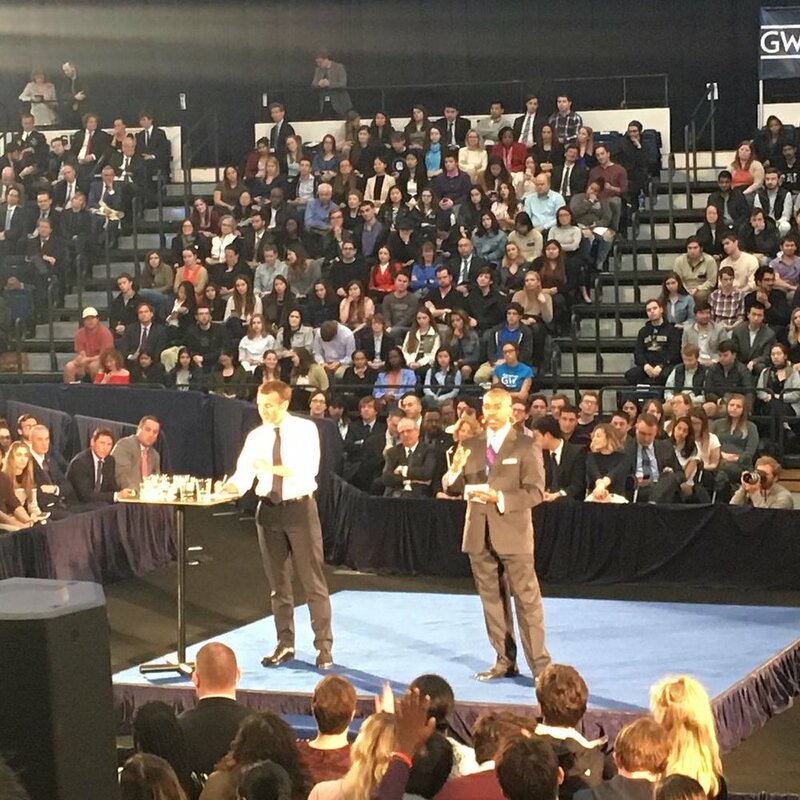 I attended events during President François Hollande’s 2014 State Visit and this time around, I was part of the Elliott School contingent at President Macron’s Town Hall at alma mater, The George Washington University. French President Emmanuel Macron and Amb. Reuben Brigety, Dean of the Elliott School of International Affairs, The George Washington University. 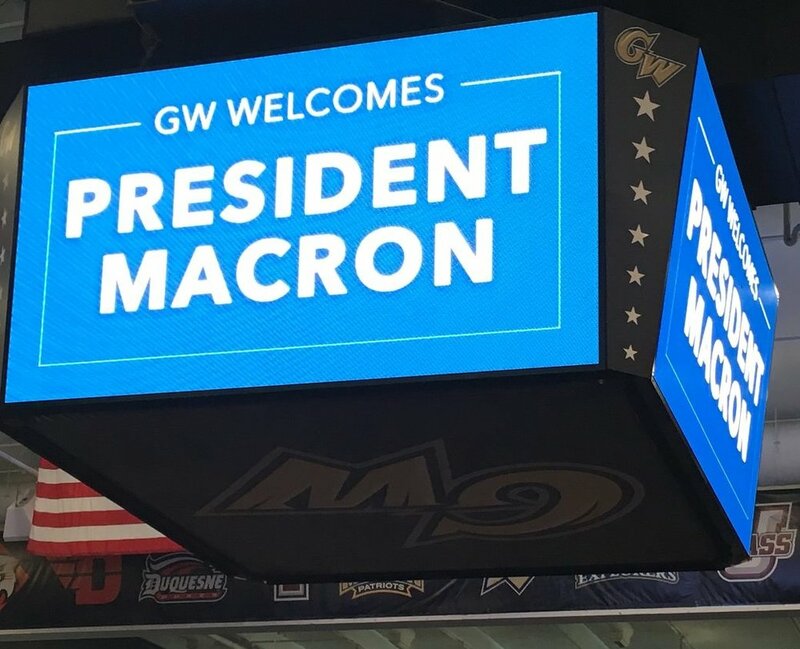 PLUS: In case you missed it, my piece on the hidden history of Franco-American basketball diplomacy was published in the Washington Post’s Made By History column during Macron’s stay. The key point, other than France being a basketball breeding ground, is that there are many more cultural ties between the two countries than most people think.